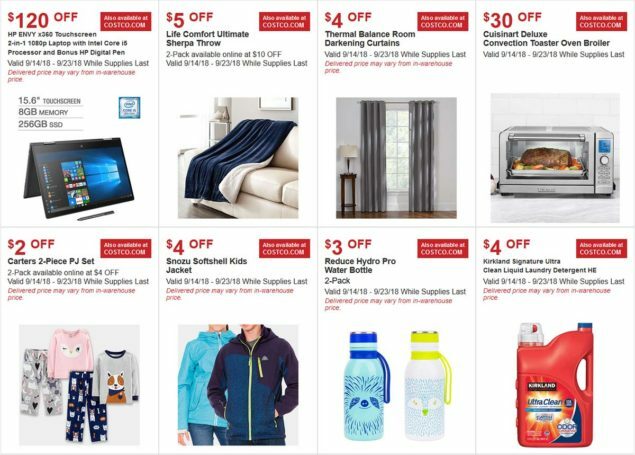 The September 2018 Costco Hot Buys Coupons have finally come out! In an unusual twist they’ve come out in the middle of the September 2018 Coupon Book instead of between coupon books. They started September 14th and run through September 23rd except for the Kirkland Signature Energy Shots, which run through October 5th. The amount of time is about the same as last month (1.5 weeks), but there are now 2 less hot buys than August. Three of the deals this month are Kirkland Signature products. The September 2018 Hot Buys once again don’t blow us away. If you regularly use Kirkland Signature Energy Shots then it’s a good deal at $8 off, making the regular $26.99 and the Extra Strength $30.99 for 48 bottles. We do find the Carters 2-Piece PJ Sets quite adorable, but we’re currently not in the market for any of those. Good to know they are in the store though, we’ll have to check them out.